When it comes to creating a flawless “face,” you know that concealer is KEY. But here’s a question –– is your concealer color correcting? 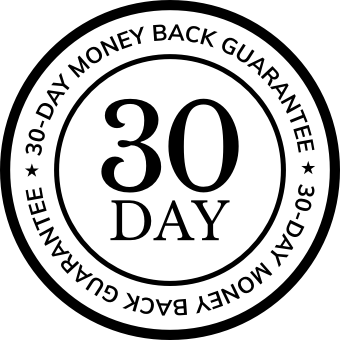 If it’s not, you may be missing out! What Is a Color Correcting Concealer? Color correcting concealer has long been a secret of makeup artists. It involves the use of colored concealers that are able to hide blemishes, dark circles, and skin imperfections better than your usual skin-toned concealer. 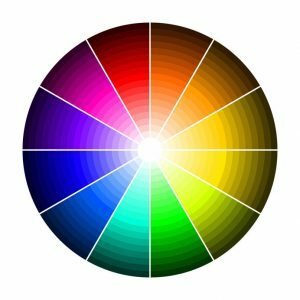 This works because certain colors cancel out their opposite color on the color wheel, so a particular colored concealer can hide a particular colored blemish. 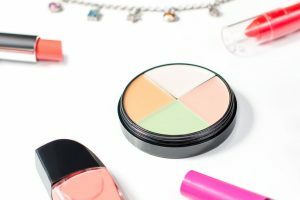 If you look at a color correcting palette of concealer, with its bright hues of pinks, purples, and greens, it may seem ludicrous to put these on your face. You’d like to look sophisticated, not like you’re going to a unicorn party. But… prepare to be surprised. 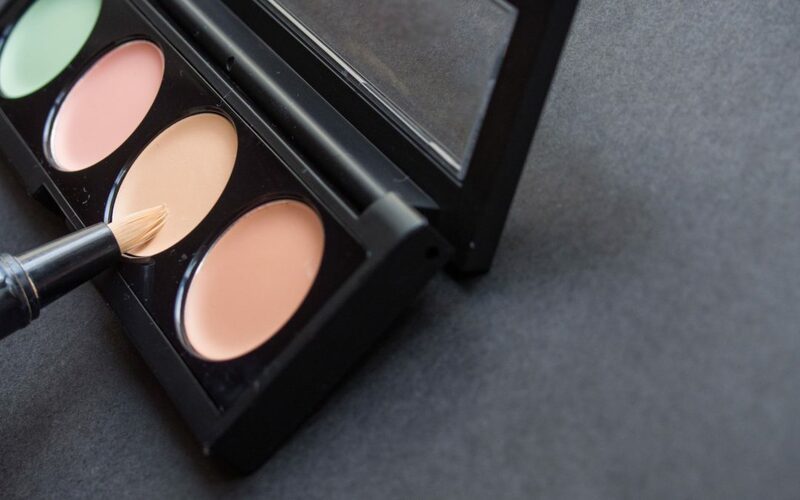 Most good color correcting concealers come in a palette so you’ll have access to several key color correcting shades. You’ll want to start by carefully applying the color with a concealer brush, then gently applying your foundation over the top with a makeup sponge. Here’s a concealer color guide on how to use each color to your advantage. Green concealer is your best friend if you have an overly red complexion, or red spots. Conditions like allergies, pimples, old acne scars, or rosacea can all cause redness on the complexion. And, a basic beige concealer doesn’t effectively hide them. As green sits opposite red on the color wheel, it’s your secret weapon. For pimples, you’ll want to just pop a little green concealer over each spot. Note: If your entire face looks ruddy, as with rosacea, you should choose a color correcting green primer which you can easily use all over your face. Orange concealer and pink concealer are both useful for dark under-eye circles. Dark circles are a common cosmetic issue, and they’re notoriously difficult to get rid of.1 The good news is, orange concealer may help reduce their appearance. As orange sits opposite blue on the color wheel, it’s a great choice for disguising dark circles or dark spots on darker skin tones. First off, you’re going to want to tap your orange concealer all over those blue eye circles. Then, apply your regular concealer over the color with a beauty blender. For lighter skin tones, pink or lighter peachy concealers are your best choices. Sometimes, dark circles on lighter skin tones can appear as blue, purple, and even green in color. Pink concealer is great at covering all of these tones because it’s a mix of red, orange, and yellow. It’s also a great color for targeting dark spots on lighter skin, like age spots. As with orange concealer, you should finish by dabbing on your regular concealer across the eye area. When you think of yellow concealer, you’re going to be focusing on the color purple. Yellow cancels out purple. So, purple blemishes, veins, dark circles, or bruises are all best hidden with a yellow-hued concealer. Speaking of the purple and yellow partnership, there’s also such a thing as a purple concealer. This is used for combating yellow undertones, or a dull complexion. A purple concealer in the form of a primer would be best here, so you can effectively target yellow undertones across your entire face. What is a Color Correcting Primer? A color correcting primer is similar to a concealer but it’s much better for larger areas of the skin. Just as you may already use a primer to “prime” your face for makeup, a color correcting primer acts in the same way. It will start by priming your skin, then the tint in the primer will help to disguise your particular skin issue – so, a green tint would help a red skin tone. Color correcting primers are a better choice on larger areas as concealers can be quite thick and take some work to blend. A primer will easily absorb into the skin. So, how do you know whether it’s best to use a color corrected primer or concealer? Do you need to cover a spot, dark circle, or scar? Use a powder or cream concealer. Is your entire face looking sallow, yellow, or red? Opt for a good tinted primer. Now that you have a concealer color guide, there’s one more step – learning the dos and don’ts of using color correcting concealers. Don’t use too much: There is such a thing as using too much colored concealer (you don’t want to go too heavy and wind up looking like Kermit the Frog). A well-placed concealer of any color should disappear under your foundation. Start thin! Do select the right color: Make sure to select the correct color for the correct blemish and then only if that blemish is strong in color. Smaller, less noticeable blemishes are still best served with a regular concealer. Do match your skin tone correctly: Remember that orange is for darker skin, and peachy pinks are for lighter skin. Do apply properly: Carefully blend your chosen color using a makeup sponge, so that it goes right into the skin. Don’t overdo it: Ensure that you only use pigment in the areas that require it. Pigment used on regular skin has nothing to neutralize. Don’t use concealer everywhere: Don’t use a colored concealer product all over your face. Choose a primer for that job instead. Don’t forget to allow the real you to still shine through! As with regular concealer, don’t go overboard. So, whether you have pale skin or darker skin, if you’re trying to hide skin imperfections, dark circles, yellow undertones, or dark spots – a color correcting concealer is makeup magic! Just remember to stay light-handed, and apply incrementally, for optimal (invisible) neutralization of those pesky blemishes.